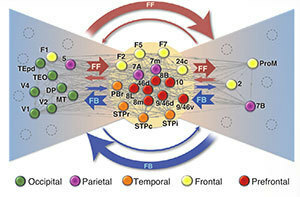 Using brain-wide and consistent tracer data, the researchers describe the cortex as a network of connections with a “bow tie” structure characterized by a high-efficiency, dense core connecting with “wings” of feed-forward and feedback pathways to the rest of the cortex (periphery). The local circuits, reaching to within 2.5 millimeters and taking up more than 70 percent of all the connections in the macaque cortex, are integrated across areas with different functional modalities (somatosensory, motor, cognitive) with medium- to long-range projections. The authors also report on a simple network model that incorporates the physical principle of entropic cost to long wiring and the spatial positioning of the functional areas in the cortex. They show that this model reproduces the properties of the connectivity data in the experiments, including the structure of the bow tie. The wings of the bow tie emerge from the counterstream organization of the feed-forward and feedback nature of the pathways. They also demonstrate that, contrary to previous beliefs, such high-density cortical graphs can achieve simultaneously strong connectivity (almost direct between any two areas), communication efficiency, and economy of connections (shown via optimizing total wire cost) via weight-distance correlations that are also consequences of this simple network model. This bow tie arrangement is a typical feature of self-organizing information processing systems. The paper notes that the cortex has some analogies with information-processing networks such as the World Wide Web, as well as metabolism, the immune system and cell signaling. The core-periphery bow tie structure, they say, is “an evolutionarily favored structure for a wide variety of complex networks” because “these systems are not in thermodynamic equilibrium and are required to maintain energy and matter flow through the system.” The brain, however, also shows important differences from such systems. For example, destination addresses are encoded in information packets sent along the Internet, apparently unlike in the brain, and location and timing of activity are critical factors of information processing in the brain, unlike in the Internet. The data was generated by collaborator Henry Kennedy, director of the Stem-cell and Brain Research Institute in Lyon, France, and his research group. Other co-authors of the paper include Kennedy as well as Nikola T. Markov and Kenneth Knoblauch, also of the institute; Mária Ercsey-Ravasz of Babeş-Bolyai University in Romania; and David C. Van Essen of Washington University School of Medicine in St. Louis. Photo: A bow tie representation of the network of connections between cortical areas in the brain. Originally published by Gene Stowe and Marissa Gebhard at news.nd.edu on November 01, 2013.